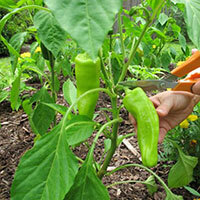 There are many garden tips out there that you can use to help you get the most out of your vegetable garden. While it's not possible for anyone to compile them all, we have decided to put together some of the best ones we've come across over the years. Some of these tips you may have already heard, some of them might be new to you. 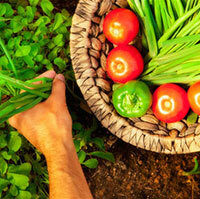 Both will help you start a successful veggie garden! Much of this article is geared towards newer gardeners just getting started. Solarizing Your Soil: One of the best vegetable garden tips I've heard in a long time was so devilishly simple, I could not believe I had not heard of it sooner! It's called solarizing your soil. I've grown up around friends and family who have grown successful vegetable gardens for years, and I've always seen them prepare their sites roughly the same way. First, some gardeners will dig up all the grass in a new area they want to grow in, then they buy, rent, or borrow a tiller and start turning the soil over. Others won't even bother with the grass and weeds and just till them altogether figuring they will kill the grass anyway. While tilling is a necessary process, I had never considered there was an easier way to kill off all the grass and weeds without chemicals. Solarization is one of the easiest vegetable garden tips. First decide how big of a garden you want to grow. Then get yourself some heavy black plastic or tarps from the local hardware store. (I've read that clear plastic works too, but I prefer the black and I'll explain why later). Lay out the tarps or plastic across the growing area, preferably in a single sheet if possible, but you can overlap multiple sheets. Take old pieces of lumber, or heavy stones or rocks from around your garden, and lay them across the ends of the plastic, and especially the sections where they overlap. You want to cover as much of the seams as possible because you are effectively sealing off the ground from airflow. Within a few weeks of having the sun beat down on the plastic, the air underneath the plastic will rise well above lethal levels for any grass, weeds, insects, and even bacteria that might be living in your soil. (black absorbs more heat, which is why I prefer black plastic). This is one of those vegetable tips that you have to begin as early in the year as possible so that you can begin planting as soon as the last frost has past. Intercropping: More great vegetable garden tips come from the practice of intercropping, or multicropping. This practice is also very easy to understand and implement, and we have a whole article dedicated to the finer points of this practice. Just search our site for "companion planting". Intercropping is very common in smaller gardens where growing space is at a premium. The concept is very simple. While you are waiting for a slow growing plant to reach maturity, take advantage of the open ground space to start some fast growing veggies like radishes or lettuce. 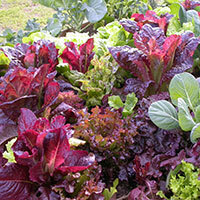 Before your main crop grows big enough to take up that space, you could already be eating some great vegetables. Intercropping is one of those vegetable tips that really goes a long way! Use Your Vertical Space: Some of the best vegetable garden tips are the ones that give you helpful advice on how to make the most out of the vertical space in your garden. Contrary to popular belief, the best producing gardens are not always the biggest ones, or the ones that cover the most ground. Just because you don't have a lot of surface area to grow in, doesn't mean that you can't have an exciting and productive vegetable garden. There are plenty of veggies that can grow up instead of out, such as beans and squash for example. Adding shelves for container veggies, or stakes and trellises can go a long way towards maximizing the crops that you can grow in a limited amount of space. Container Vegetable Gardens: Container vegetables are another one of those great vegetable tips that a lot of folks either don't consider or don't think they can get good results from. The fact is there are plenty of vegetables that do just fine in containers, peppers and tomatoes are two of the most common. I'm sure most of you reading this have seen tomato or pepper plants hanging upside down in buckets or other containers. While not every vegetable is suited for container growing, containers offer a unique set of opportunities that a fixed garden does not. For instance, if you are an urban gardener who is forced to grow on a rooftop or balcony, containers will give you the option of moving your veggies around if a single location doesn't provide optimal sun light all day long. 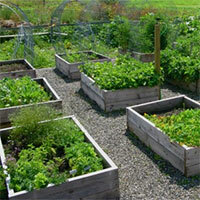 Containers also have the benefit of isolating each veggie plant from the others. If you've followed some of our other vegetable growing tips in other articles, you have probably already begun mixing your own growing medium. Where a fixed garden you are more or less forced to grow all of your vegetables in the same growing mix, containers offer you the ability to customize the soil for each plant, independently of the others. 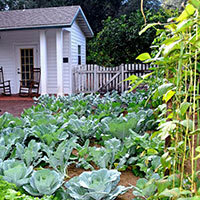 There are a great many vegetable garden tips out there for gardeners of all age and skill levels. Far too many for any one article or web site to list them all. There are also vegetable specific growing tips that you can look up and use for the particular crops that you are growing. Beyond all that, the best teacher is experience. Don't be afraid to experiment and try new things that you may not have considered before. Every location is different, and in time, you will find the best tips of your own, that work best in your garden.